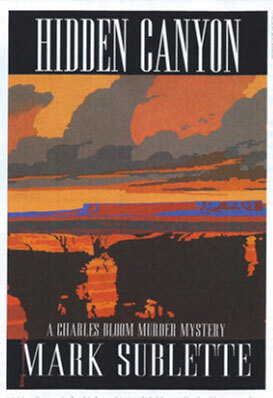 Author Mark Sublette's latest art mystery, Hidden Canyon, is the third novel in his Charles Bloom Murder Mystery series. Sublette recently signed copies of Hidden Canyon at Medicine Man Gallery, 6872 E. Sunrise Drive, Suite 150, in Tucson, Arizona. Hidden Canyon is the third novel in Mark Sublette's Charles Bloom Murder Mystery series. A former emergency room physician, Sublette draws heavily from his medical background in his latest novel. "When I was in the Navy I worked as a doctor in a busy emergency room and managed numerous injuries of varying severity," recalls Sublette, "Nothing like standing in pools of blood to help future writings for a good murder mystery. You see many bizarre ailments, which confirm that almost anything can be a cause of trauma, even a pencil." Set on the Navajo reservation, the storyline in Hidden Canyon revolves around an early petroglyph site hidden on Rachael Yellowhorse's ancestral lands and the adjacent property owned by the Manygoats family. These ancient works of art hold a secret with a power so strong their Anasazi makers kept them out of the reach of mere mortal human beings. 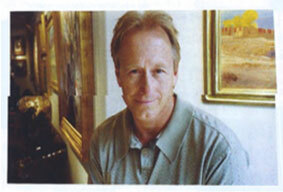 Anglo art dealer Charles Bloom unwittingly promotes the sacred rock art images at his Santa Fe Indian Market show and sets in motion a cascading series of events that leads to the worst kind of human being searching out these hidden petroglyphs. Little could Bloom know that his discerning eye for art would connect him to a chain of murders stretching back 40 years earlier and to an individual who is not a collector of native art but a psychopathic killer, the likes of which the Dine, the preferred name of the Navajo people, have no word to describe. Bloom will need all his observational skills to spot the killer before it's too late. It's a race against ancient history, and time may finally be running out for Bloom. As with his two previous novels - Paint by Numbers and Kayenta Crossing - Sublette continues to fuse his savvy business sense of the art scene and rich knowledge of Native American subjects into a pager-turner in which rare petroglyphs, music and art all collide. "Mark Sublette has managed to capture the spirit of not just the Southwest but also the fascinating art market that he knows so well. Only someone with his depth of experience is capable of blending these two worlds in such an accurate yet absorbing way!" remarks Joshua Rose, editor of Western Art Collector. Hidden Canyon can be purchased online at medicinemangallery.com ($24.95). It also will be available on Amazon.com - both as a hardcover and eBook - and as an eBook on other major websites such as Barnes & Noble. A fourth book, titled Stone Men, centers on the turquoise trade and fake Indian jewelry and is tentatively set to be released in late 2014.